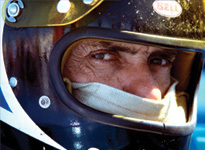 George Follmer is truly one of the living legends of auto racing. He is also one of the most versatile drivers in the world, having competed in virtually every form of auto racing, winning at most. Follmer is the only professional racing driver from the United States who has competed in Indy Cars, NASCAR, Formula 1, the World Endurance Championship, Can-Am, Trans-Am and IMSA. 1960 California Sports Car Club "Rookie of the Year"